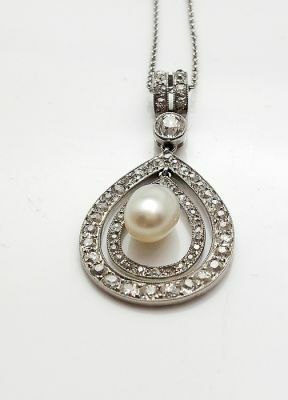 A beautiful Edwardian platinum pendant necklace featuring 1 freshwater pearl, approx. 9.2 x 5.97mm; 1 old European cut diamond, est. 0.28ct (Si2 clarity & I colour) and 64 old European cut diamonds,est. 1.63ct (SI1-I1 clarity & H-I-J colour). The chain is approx. 18 inches (45.72cm) in length.